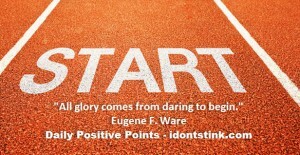 Just Get Started | I Don't Stink! It is so easy for us to just delay in starting something new by waiting until the time is right. If we take that approach, we often will never get started at all. In my experience I have found that getting started is often the hardest part because I normally like to have the full picture in a nice laid out project plan. Well, life doesn’t work that way. Now if something inspires me, I get started right way. I actually have about 4 books that are from 60-85% complete. I would get an idea and just run with it. If I took time to think it through and complete a full plan on it, I would not have started and wouldn’t have several books close to being completed. I believe it is always best to plan so don’t get me wrong there. I am talking about inspiration. Early on in my life I would be inspired to do something, start something, create something only to not get started because I couldn’t see the full picture. Not any more.